In part 4, I have demonstrated how to create empty instance groups and computer groups using the OpsMgrExtended module and in part 5, I’ve demonstrated how to add a Windows Computer object to a Computer Group as an explicit member. 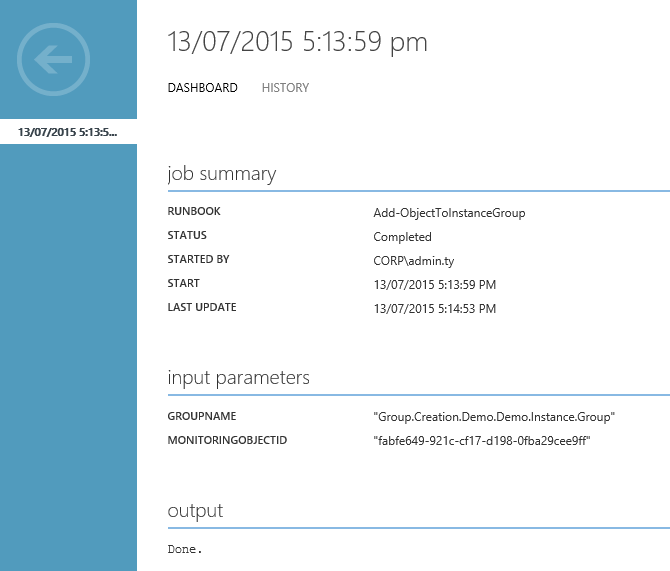 In this post, I will share a runbook that adds a monitoring object to an Instance Group. As I mentioned in Part 4, I will dedicated few posts on creating and managing OpsMgr groups, this post would be the 3rd post on this topic. Write-Verbose "Validating specified monitoring object ID '$USING:MonitoringObjectID'"
Write-Error "Unable to find the monitoring object with ID '$USING:MonitoringObjectID'." Write-Verbose "Monitoring Object ID '$USING:MonitoringObjectID' found. Monitoring Object Full Name: '$($MonitoringObject.FullName)'." Write-Verbose "Getting the instance group '$USING:GroupName'." Write-Error "$Using:GroupName is not found." Write-Verbose "Check if the group '$USING:GroupName' is an instance group"
Write-Error "$Using:GroupName is not an instance group"
Write-Verbose "Checking if the monitoring object '$USING:MonitoringObjectID' is already a member of the group." Write-Warning "The Monitoring Object with ID '$USING:MonitoringObjectID' is already a member of the instance group $USING:GroupName. No need to add it again. Aborting." Write-Verbose "Getting the group discovery rule"
Write-Verbose "Group Populator discovery found: '$($GroupPopDiscovery.Name)'"
Write-Error "No group populator discovery found for $Group." Write-Error "$Group has multiple discoveries using Microsft.SystemCenter.GroupPopulator Module type." Write-Verbose "The group populator discovery '$($GroupPopDiscovery.Name)' is defined in management pack '$GroupPopDiscoveryMPName'." Write-Verbose "Checking if '$GroupPopDiscoveryMPName' MP is sealed." Write-Error "Unable to update the group discovery because it is defined in a sealed MP: '$($GroupPopDiscoveryMP.DisplayName)'." Write-Verbose "'$GroupPopDiscoveryMPName' MP is unsealed. OK to continue." Write-Verbose "Getting the MP reference alias for 'Microsoft.SystemCenter.InstanceGroup.Library' from the group discovery MP '$GroupPopDiscoveryMPName'." Write-Error "The group discovery MP '$GroupPopDiscoveryMPName' is not referencing the 'Microsoft.SystemCenter.InstanceGroup.Library' MP. Unable to continue." #Exit. We are not going to create the reference now because the instance group library MP should have already been referenced. Write-Verbose "The MP Reference Alias for 'Microsoft.SystemCenter.InstanceGroup.Library' is '$InstanceGroupMPAlias'." #Check if monitoring class is defined in an unsealed MP and the group discovery is defined in another MP. 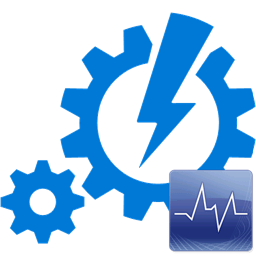 Write-Error "The Monitoring Class '$MonitoringClassName' is defined in an unsealed MP '$MonitoringClassMPName', but the group discovery is defined in another MP. Unable to add the monitoirng object to the group because the unsealed MP cannot be referenced in other MPs." Write-Verbose "The Monitoring Class '$MonitoringClassName' and the group discovery are defined in different MPs." Write-Verbose "The Group Discovery MP '$GroupPopDiscoveryMPName' is not referencing the monitoring class MP '$MonitoringClassMPName'. Creating the reference now." #The reference to the monitoring class MP already existed. Write-Verbose "The '$MonitoringClassMPName' reference alias in '$GroupPopDiscoveryMPName' is '$MonitoringClassMPAlias'." Write-Verbose "The monitoring class '$MonitoringClassName' and the group discovery is defined in the same MP. No need to create MP reference alias for monitoring class MP." Write-Verbose "The <MonitoringClass> value in <MembershipRule> is '$MemberShipRuleMonitoroingClass'." Write-Verbose "Updating the discovery data source configuration"
#Either the monitoring class MP was already referenced in the group discovery MP, or the monitoring class and group discovery are defined in the same MP. Write-Verbose "Since the group discovery MP '$GroupPopDiscoveryMPName' wasn't referencing the monitoring class MP '$MonitoringClassMPName', no need to check existing membership rules. Creating a brand new <MembershipRule>." Write-Verbose "The Monitoring Class MP '$MonitoringClassMPName' was already referenced in the group discovery MP '$GroupPopDiscoveryMPName', but there are no <MembershipRule> defined for the monitoring class '$MonitoringClassName'. Creating a new <MembershipRule> element in the group discovery." Write-Verbose "Updating the group discovery"
throw "Unable to add monitoring object '$MonitoringObjectID' to group '$GroupName'." In order for you to use this runbook, you will need to modify line 9 with the name of the SMA connection you’ve created in your environment. GroupName: The internal name of the group. I did not use the display name because it is not unique. Monitoring Object ID: The ID of the monitoring object that you wish to add to the instance group. Since the monitoring object ID is not visible in the Operations Console, I have previously posted an article and demonstrated several ways to find this Id for monitoring objects: Various Ways to Find the ID of a Monitoring Object in OpsMgr. If you are also using Squared Up dashboard, you can also use Squared Up to lookup and export the Monitoring Object ID as demonstrated in this YouTube video. I have added a lot of comments and verbose messages in this runbook, therefore I don’t feel I need to explain how it works. If you’d like to know what it does step-by-step, please read the code. 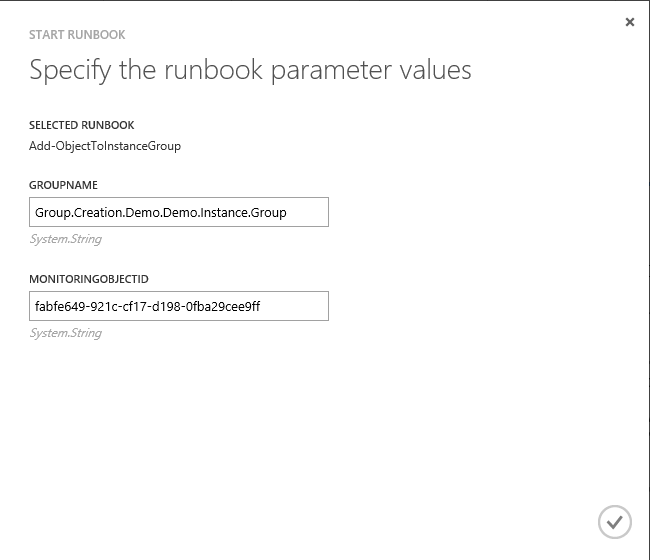 I have coded the runbook to also check if the monitoring object that you want to add is already a member of the group (by looking up related objects of the group instance). If it is the case, the runbook will write a warning message and exit without adding it. 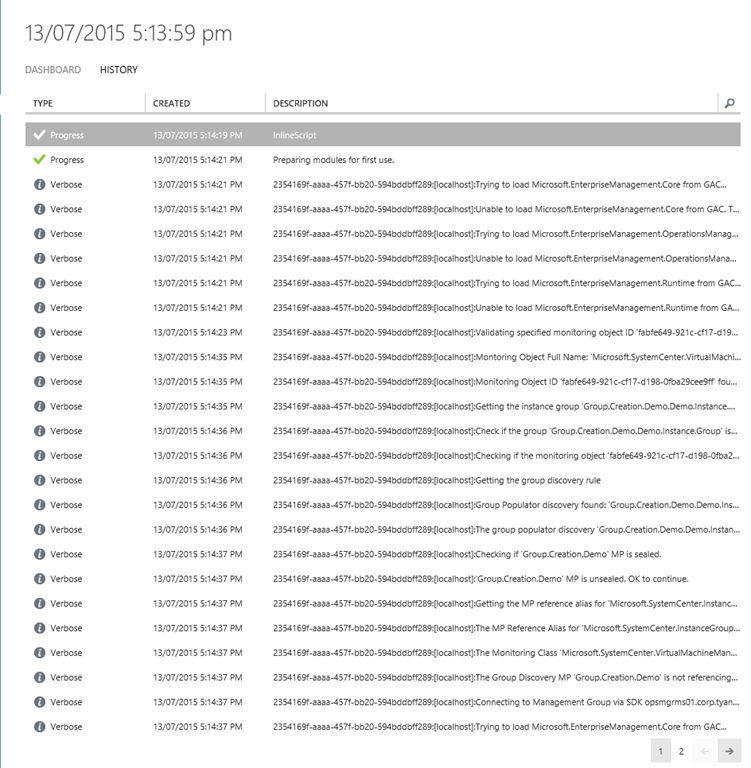 ce2dd108-0129-4fc0-842b-347311cb9107:[localhost]:The Monitoring Object ‘Microsoft.SystemCenter.VirtualMachineManager.201 2.HyperVHost:HYPERV03.corp.tyang.org;2541ebea-50ae-4d4b-8755-5b77a50cd32b’ (ID:’fabfe649-921c-cf17-d198-0fba29cee9ff’) is already a member of the instance group Group.Creation.Demo.Demo.Instance.Group. No need to add it again. Aborting. This is a rather complicated runbook and most of the code runs within InlineScript. To make everyone’s life easier, I will add this as a function in the OpsMgrExtended module upon next release. 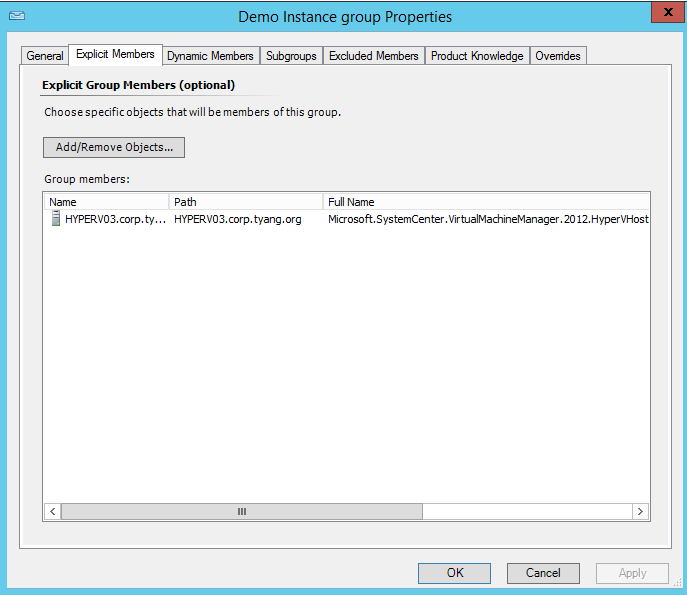 In the next post, I will demonstrate how to update a group by updating the group discovery.